BROWNSVILLE, TEXAS – A group of undergraduate business students from The University of Texas Rio Grande Valley in March beat out more than 500 teams from 37 countries to capture their first ever championship win in the 15th annual CME Group Trading Challenge. The UTRGV team – made up of students Christopher Martinez, of McAllen; Michael Villarreal, of Rio Grande City; and Jose Naveja, of Progreso – finished the competition with a total of $706,585, handily beating out second-place competitor Kansas State University, who earned $533,910. The Trading Challenge is a complimentary four-week electronic trading competition in which teams of university students trade CME Group products from different asset classes. The trading environment is simulated, and works on a real-time professional trading platform provided by CQG. The UTRGV team, named UTRGV-EDINBURG-2, said they were guided and prepared well by Dr. Bruno Arthur, lecturer II in UTRGV Economics and Finance, and faculty advisor for the first-place team as well as The Trading Association student organization. 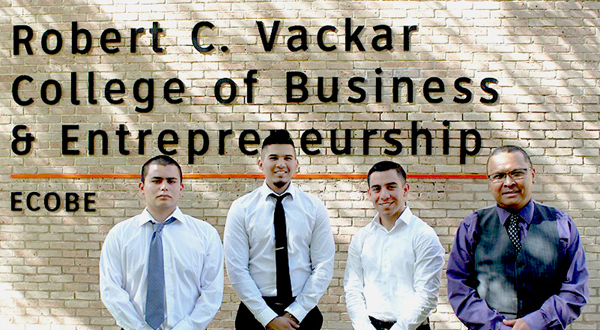 The UTRGV champions are undergraduates in the UTRGV Robert C. Vackar College of Business and Entrepreneurship and members of the student organization, The Trading Association. To prepare for the challenge, they also took relevant courses, such as financial derivatives, or money and banking, in the Department of Economics and Finance. A total of three undergraduate teams from the Edinburg Campus, one undergraduate team from the Brownsville Campus, and one graduate team at the MBA level, represented UTRGV at the competition. In 2017, the UTRGV undergraduate team ranked 18th out of 595 participants in the CME Trading Challenge. The four-week electronic trading competition is open exclusively to teams of currently enrolled graduate and undergraduate students, offering them a chance to learn hands-on techniques for trading futures across all major asset classes on CQG‘s real-time professional trading platform. The trading challenge also helps educate the next generation of finance professionals on the significance of CME Group’s global derivatives markets. The teams were given $100,000 in simulation money to trade in the first round. After two weeks of playing the market, teams were ranked, and only the top 10 percent – about 53 teams – advanced to the championship round. In the second round, teams were provided with $250,000 for an additional two weeks of trade, and were ranked one final time. The UTRGV team achieved 182.63 percent returns in two weeks of trading using CQG’s tools. In addition to taking the top spot, the three students won a cash prize, and airfare and hotel to attend a one-day market education conference at the CME Group in April. CME Group provides a wide range of risk management education. In addition to interactive events like the Trading Challenge, CME Group partners with other industry organizations to offer educational tools, such as Futures Fundamentals, a one-stop educational resource that explains the role of futures markets in everyday life. CME Group exchanges offer a wide range of global benchmark products across all major asset classes, including futures and options based on interest rates, equity indexes, foreign exchange, energy, agricultural products and metals.